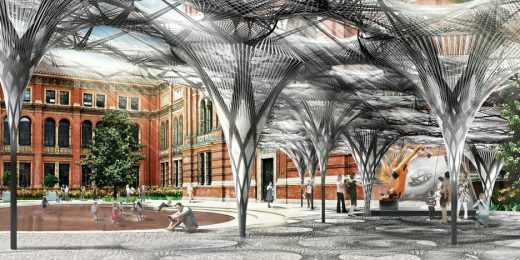 The first major retrospective of the most influential engineer of the 20th century and a site specific installation inspired by nature and fabricated by robots will be the highlights of the V&A’s first ever Engineering Season, complemented by displays, events and digital initiatives dedicated to global engineering design. The V&A Engineering Season will highlight the importance of engineering in our daily lives and consider engineers as the ‘unsung heroes’ of design, who play a vital and creative role in the creation of our built environment. A newly-commissioned Garden installation by experimental architect Achim Menges with Moritz Dörstelmann, structural engineer Jan Knippers and climate engineer Thomas Auer will launch the Season. Their first ever public commission in the UK, Elytra Filament Pavilion will explore the impact of emerging robotic technologies on architectural design, engineering and making. 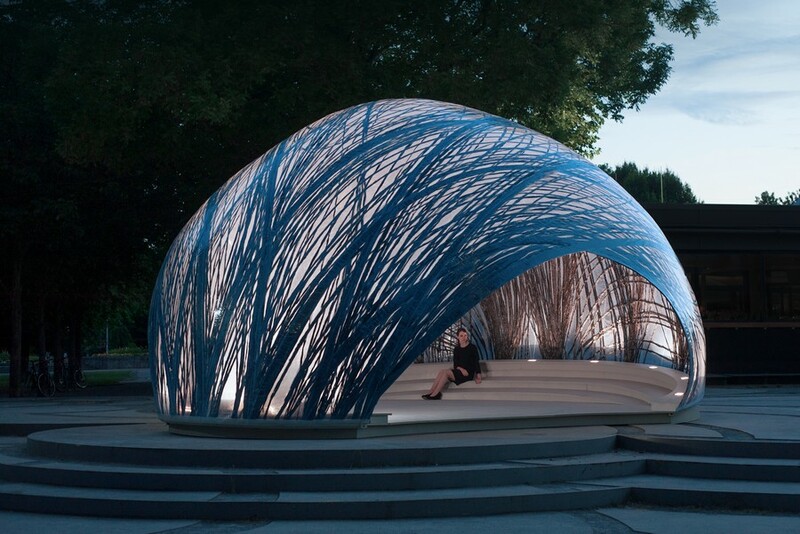 Inspired by a lightweight construction principle found in nature, the fibrous structures of the forewing shells of flying beetles known as elytra, the Pavilion will be an undulating canopy of tightly-woven carbon fibre cells created using a novel robotic production process. 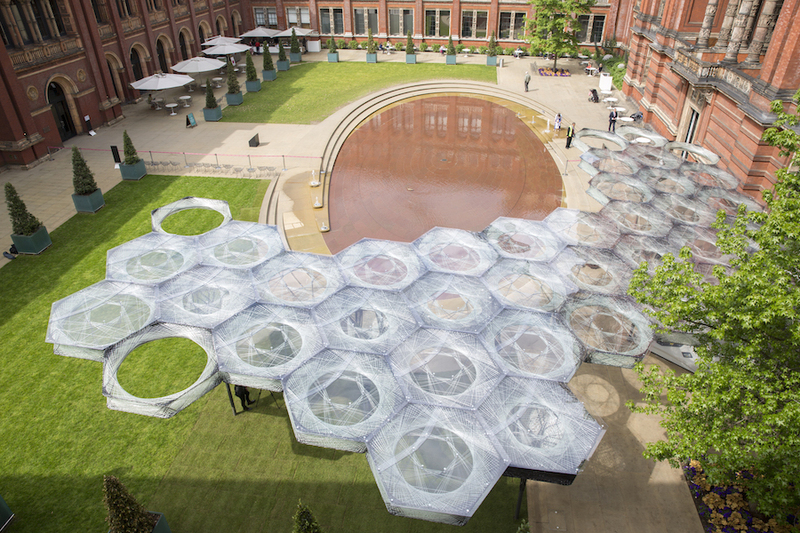 The Pavilion will grow over the course of the V&A Engineering Season in response to data on structural behaviour and patterns of inhabitation of the Garden that will be captured by real-time sensors in its canopy fibres. 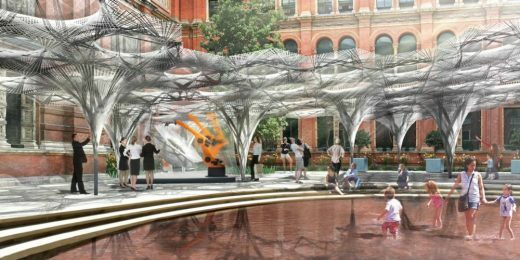 At select moments, visitors will have the opportunity to witness the Pavilion’s construction live throughout the Season as new cells are fabricated in-situ by a Kuka robot. Menges’ and Knippers’ institutes at Stuttgart University are pioneering the integration of biomimicry, robotic fabrication and new materials research in architecture and have recently completed several innovative projects in Germany. Engineering the World: Ove Arup and the Philosophy of Total Design will explore the work and legacy of Ove Arup (1895-1988), the most significant engineer of the 20th century. Ove pioneered a multidisciplinary approach to design that has defined the way engineering is understood and practiced today. Spanning 100 years of engineering and architectural design, the exhibition will be guided by Ove’s writings about design and include his early projects, such as the Penguin Pool at London Zoo, as well as renowned projects by the firm including Sydney Opera House and the Centre Pompidou in Paris. Arup’s collaborations with major architects of the 20th century pioneered new approaches to design and construction that remain influential today, with the firm’s legacy visible in many buildings across London and around the world. 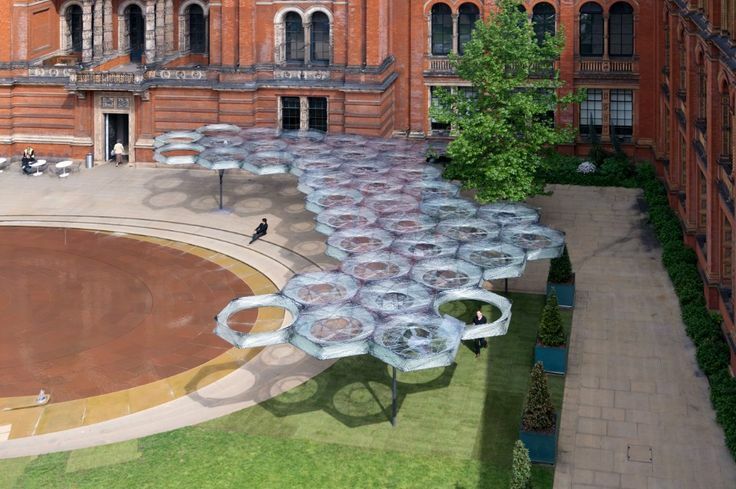 It will also showcase recent work by Arup, from major infrastructure projects like Crossrail and novel technologies for acoustics and crowd flow analysis, to engineering solutions for open source housing design. Through previously unseen prototypes, models, archival materials, drawings, film and photography, as well as a host of new immersive digital displays featuring animations, simulations and virtual reality, the exhibition will uncover the untold design stories behind some of the world’s most recognisable buildings and the engineering trends shaping the world we live in. A series of major cutting-edge engineering projects from around the world by British engineering firms such as AKT II, Atelier One, Buro Happold, Expedition Engineering and Jane Wernick Associates will be showcased in the free display Mind over Matter in the V&A + RIBA Architecture Gallery opening on 15 June 2016. These projects reflect London’s status as an engineering capital and Britain as a world leader in creativity and design. Other activities in the V&A Engineering Season will include an Exhibition Road Engineering Residency supported by the National Lottery through the Heritage Lottery Fund; a themed Friday Late; a series of lunchtime and evening lectures; talks and gallery tours, as well as a Symposium about biomimicry, design and engineering with a keynote lecture by Achim Menges. The exhibition Engineering the World: Ove Arup and the Philosophy of Total Design runs from 18 June – 6 November 2016. Tickets will go on sale in April 2016. Admission £7 (concessions available). 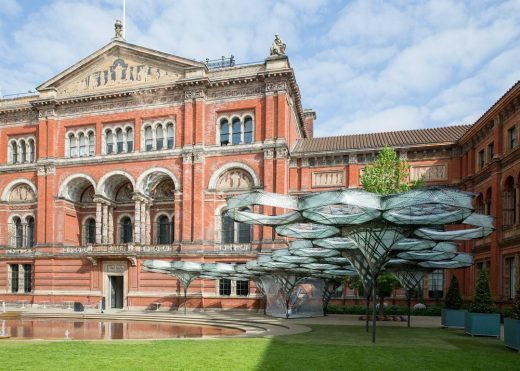 V&A Members go free. 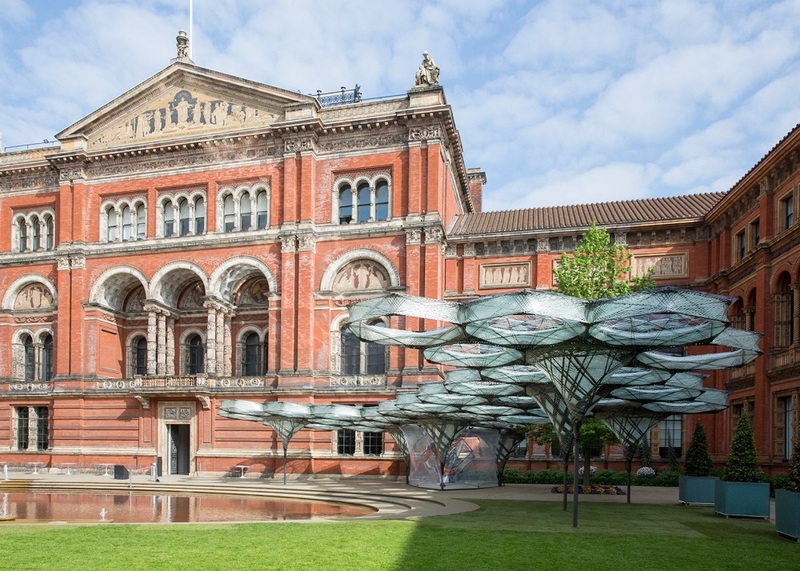 Advance booking is advised – this can be done in person at the V&A; online at vam.ac.uk/EngineeringSeason; or by calling 0800 912 6961 (booking fee applies).